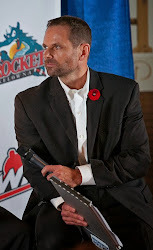 For the fourth time in the Kelowna/Tacoma Rockets 22 year history, the Washington Capitals have selected a player from the WHL franchise. Madison Bowey was taken in the second round, 53rd overall, by the Capitals on Sunday. The Capitals picked up Rockets alumnus Mark Olafson in 2003, Nolan Yonkman in 1999 and John Varga in 1992. It was a given Bowey would be selected in the first two rounds but the same couldn't be said for teammate Tyrell Goulbourne. The Philadelphia Flyers picked the Edmonton resident in the third round. While some hockey people will be surprised at the pick, remember Goulbourne is not a one trick pony. Sure he has had success fighting, with the Joe Mahon tilt in February becoming a huge hit on YouTube. The 18 year-old was also voted as the Western Conference's toughest player in the Tri City Herald Best of the West poll this past season. But aside from that, Goulbourne has elite speed and is arguably the fastest skater on the Rockets roster. His best work is on the penalty killing unit. Also don't forget, Goulbourne scored a career high 14 goals this past season and tied for the team lead in game winning goals with six. If you think he is all about fighting you are dead wrong. In the 5th round, the Detroit Redwings picked Rockets d-man Mitch Wheaton. I think the only thing that hurt Wheaton from not being selected higher in the draft was the fact he played in just 39 regular season games as a rookie. With a larger viewing with more games under his belt, in my opinion Wheaton would have had a better shot of being selected in the third round. It was nice to see Myles Bell recognized at the NHL draft when the New Jersey Devils called his name in the 6th round. Bell is as strong as an ox, and sorry Brandon's Ryan Pulock, possesses the hardest shot in the WHL. Many outsiders predict Bell will be playing pro this season, but I am not so sure he doesn't need another season to fully understand the position of forward. Is the 20 year-old (Bell will turn 20 in August) not better fit for another year of junior hockey on what many anticipate will be a Rockets team that should challenge for a WHL title? It will all come down to how well the Calgary resident preforms at Devils training camp in September. A solid camp and he has a chance to stick in the AHL. A few struggles and another season in Kelowna would only help his future development not hinder it. 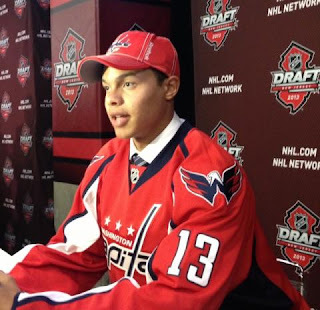 Madison Bowey will be a high pick in Sunday's NHL draft. The Kelowna Rockets d-man is projected to be a late first round selection or may fall into the early stages of the second round. TSN's Bob McKenzie has Bowey projected to go 36th overall, which leaves him six spots shy of first round status. 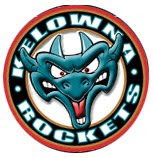 Only five Kelowna Rockets have been taken in the opening round of the draft. Kyle McLaren (Boston - 1995), Scott Hannan (San Jose - 1997), Scott Parker (Colorado - 1998), Luke Schenn (Toronto - 2008), Tyler Myers (Buffalo - 2008) all share that honour. If Bowey is indeed taken 36th overall and the order of selection remains the same as it does today, the 18 year-old Winnipeg resident will be a member of the Montreal Canadiens. Bowey will join Rockets alumnus Josh Gorges and Travis Moen as members of Le Bleu-Blanc-Rouge. If Bowey slips into the second round, he will join a solid group of former alumni like Shea Weber (2nd round - Nashville), Colton Sissons ( 2nd round - Nashville), Brett Bulmer (2nd round Minnesota), Blake Comeau (2nd round Islanders), Keil McLeod (2nd round Columbus), Nolan Yonkman (2nd round Washington) and Tuomas Gronman (2nd round Quebec Nordiques). While Bowey will undoubtedly be taken in the first 40 picks, the real question is when will teammates Mitch Wheaton and Myles Bell hear their names called at the podium? Wheaton's size alone has many scouts wanting to get their hands on the Sherwood Park, Alberta product. Is the third round realistic for a rookie defenceman who had a portion of his season shortened because of shoulder problems? Tyson Barrie (Colorado - 2009) was the last Rockets player taken in the third round and he is earning an NHL paycheck. The most intriguing player to watch will be Myles Bell. Undrafted at 18, Bell led the Rockets in scoring despite being moving from defense to forward. The 19 year-old made the transition look easy and scouts can't overlook his pro-like shot and 38 goal output. If all three are drafted on Sunday, it will mark the first time since 2009 that three players from the Rockets organization have been taken in the NHL draft. That year Tyson Barrie (Colorado), Evan Bloodoff (Phoenix) and Mitch Callahan (Detroit) had the priviledge of being selected by one of the 30 NHL teams. Nothing is guaranteed on Sunday. 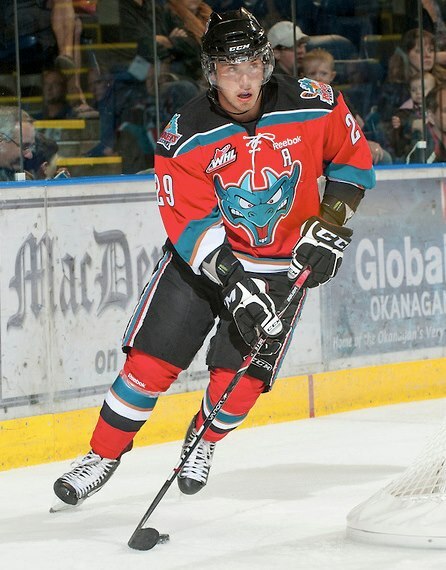 What is safe to say is the draft will be must viewing if you are a Kelowna Rockets fan. Former BC Lions receiver Brock Aynsley is one of four new inductees into the Central Okanagan Sports Hall of Fame. The Kelowna resident was a multi sport athlete, excelling in track and field and football. "I was no Bo Jackson but I definitely played a number of sports. I wish I could have continued. In those days you could because of the professionalism. I thoroughly loved track but I had to quit track when I went to professional football." Aynsley won a Grey Cup with the Montreal Alouettes in 1977. Inducted into the Team Category is the 1988 Julie Sutton curling team. The rink won the 1988 World Junior Women's Curling Championships in France. Third Julie Wood reflects on the strengths of the team. "As you the years have gone on and we have curled with different people, we now realize how magical it was and how we were suited to every position and how strong we were as a team". Hockey player Blair Chapman, who was drafted second overall in the 1976 NHL Draft by Pittsburgh and former Kelowna Buckaroos Owner/GM and Coach Wayne North will officially be inducted during a ceremony in November. Mitchell Callahan knows what it takes to win a championship. The 21 year-old captured a WHL title with the Kelowna Rockets in 2009 and now finds himself in a good position to capture an American Hockey League crown. Callahan and the Grand Rapid's Griffins lead the Syracuse Crunch two games to none in the best of seven league final. "At the beginning of the year we thought we could go pretty far. When the lockout ended we lost a few guys but that made us a harder working team. Our team really became close together so we though we could go pretty far." Callahan compares his Grand Rapids team to the Kelowna Rockets WHL championships team from 2009. "We have great leaders and older guys. In 2009 when I was 17 in Kelowna, we had older guys like Jamie Benn. We have a real close group. When we beat Vancouver in the Western Conference final we knew that everyone was doing it for each other". 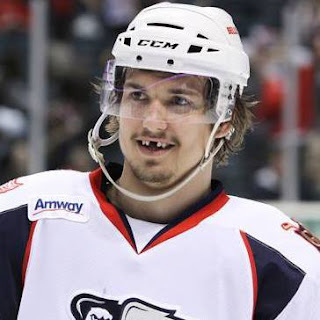 The Griffins have faced adversity both on and off the ice. In the AHL semi final against the Oklahoma Barons a game was postponed after a tornado struck the American city. "When the guys were halfway dressed, the coach said the game was delayed because of a tornado. We all went down to the parking lot and stayed there until the storm passed. It was pretty scary. I've heard it is the largest tornado in North American history which is pretty tough to believe". Callahan and the Griffins have a 2-0 lead in the AHL final with the next three games on home ice. 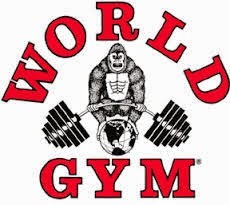 "Our coach always talks about never being to high or to low. By the looks of it we have the advantage even though we are up two games to nothing. We can't take that for granted and we can't let down at all." Callahan is enjoying playoff success playing on a line with former WHL players Tristan Grant and Landon Ferraro.